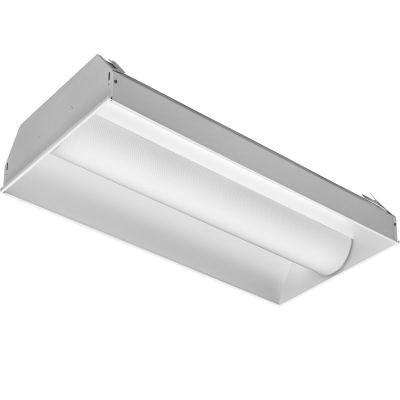 Lithonia Lighting Static air function LED luminaire features cold-rolled steel housing with gloss white enamel finish. This dimmable LED luminaire in square shape, uses 57-Watt lamp that has voltage rating of 120 - 277-Volts. It comes with a driver that uses 0 - 10-Volt control signals to control dimming functions. Lamp in the LED luminaire has color temperature rating of 4000K to ensure optimal light level in the surrounding. It has average life of 60000 hours. It has efficacy of 67 LPW. Lamp offers 4000-Lumens of bright light output. It measures 24-Inch x 24-Inch x 5-1/2-Inch. Luminaire features molded light traps that prevent light leakage between shielding and end-plates. This 8-Inch open perforated metal shade backed with white acrylic diffuser creates soft light to the surrounding. It features matte white polyester powder paint finished reflector that offers uniform light distribution. This recessed mountable LED luminaire is ideal for large spaces including open offices, circulation areas, classrooms, libraries, cafeterias, airport ticketing, wait areas and other commercial applications. LED Luminaire is CSA certified and IC rated.